The first guest was his third and then current wife Veronica from backstage said “he said he was afraid of me!” She said they met in Salt Lake City where he was training. Then Ali’s parents came out. His mother Odessa Ali nicknamed “Bird” due to her small nose. 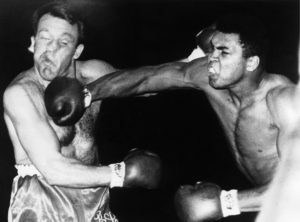 His mother said “when he was eighteen months old he was strong and was swinging his arms and knocked out one of my teeth and loosened another.” Then Ali’s brother Rahman Ali came out who was eighteen months younger and also was a boxer (14-3-1). Then by film came his father’s sister and Ali’s Aunt Eva in her barber shop in Louisville giving former heavyweight champion Jimmy Ellis a haircut. “I change your diapers and all you could say was “GG” and later said it meant Golden Gloves,” said Aunt Eva. Then another film came on with Ellis racing by foot next to a school bus like Ali did growing up and ran up to a school where Ali attended and there was his third grade school teacher Mrs. Carter. “Muhammad came to the YMCA that I worked at after retiring from teaching with a check for $10,000.00 for underprivileged children,” said Mrs. Carter. Next thing you know Mrs. Carter and Ellis came out from back stage. Next guest was from the 1960 Olympics in Italy that lost to Ali in the finals from Poland Ziggy Pietrzykowski. He was followed by Olympian Wilma Rudolph from the same Olympics where in track she won three Gold Medals and one Bronze Medal. They were in a parade together when they came to the states. As he hugged her when she came out (rumors back in 1960 it was Ali’s first love) Ali would look over at his wife as if to see was she jealous. By film was actor Anthony Quinn who starred in the movie “Requiem for a Heavyweight” that Ali did a cameo in. Next out was Ali’s former three fight opponent “Smokin” Joe Frazier. After they hugged Ali sat down as Frazier started talking how he gave Ali a ride in his Cadillac to New York. “I couldn’t get a word in the whole trip,” said Frazier. Then it was former great world champion on film Joe “The Brown Bomber” Louis who was recuperating from a stroke. Finally out with their nanny came Ali’s two young daughters that he hugged and kissed while holding both of them in his arms! All in all in was a great show with plenty of laughs! Boxing’s First Female Judge and Four Former Champions in Hatfield, PA, Saturday! This Saturday at the BucksMont Indoor Sports Center, 2278 North Penn Road, Hatfield, AP. 19440 should be well attended from 10:30am to 4:00pm. 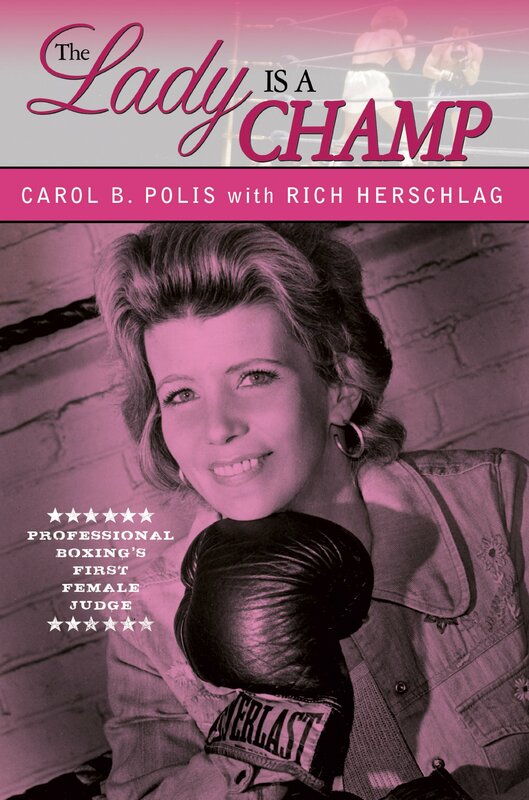 The first female boxing judge in the country Carol Polis will be selling her book, “The Lady is a Champ” and will be selling autographed photographs. Come out and meet Carol in person along with four professional boxers on Saturday, September 10, 2016. I personally know Carol and purchased her excellent book. It’s worth every cent you invest it in. Carol is also a great guest speaker at libraries, nursing homes and any sporting event. I have heard he speak and she keeps your attention on every word. Carol should be there at 10:30am when the show starts. Joining Carol will be four former world boxing champions of which two were teammates on the 1984 USA Olympic Boxing team where both won Gold Medals.